This recipe is a labour of love, as is the Eid lunch - cooking for those you love deserves such dedication. Sumayya Usmani is a cookbook author, writer and cookery teacher who specialises in Pakistani cuisine. 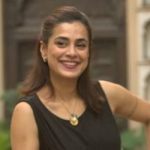 She contributes to many UK-based food magazines and is currently writing a memoir-style cookbook on Pakistani cuisine, called Summers Under the Tamarind Tree, to be published in Spring 2016 by Frances Lincoln. Sumayya also hosts cookery classes at Sophie Grigsons’ Cook School, Oxford and Divertimenti Cookery School, London. Begin by par-boiling the soaked rice - it should be firm but not entirely raw. Drain and set aside. Place a heavy-based saucepan over a medium-low heat and add the oil and ghee. When hot, add all the whole spices and cook for 30 seconds, or until you can smell the oil being aromatized by the spices. Increase to a medium heat, add the red onions and fry until light golden. Add the ginger and garlic and cook for 30 seconds, until the garlic no longer smells raw. Add the tomatoes and cook until the moisture has evaporated (add about 1-2 tbsp for water if the tomatoes start to burn). The result should be a thick, rich sauce with no hard tomato bits, and the oil should rise to the surface of the sauce. Add the turmeric and red chilli powder. Add the beef and stir-fry until sealed, for about 2-3 minutes. Add the Greek yoghurt and continue to stir-fry until the moisture of the yoghurt evaporates and you are left with a sauce consistency. Cover the pan and turn the heat to low. Allow to cook until the sauce is thick and reddish-brown, and the oil rises to the top; this will take around 15-20 minutes of cooking. After this time if the meat isn’t cook through, you may need to add a little water and cook covered for a few more minutes until the sauce is thick again. Once the meat is cooked through, layer the rice evenly on top of the meat. Poke the lemon, mint and green chilli into the rice, pour over the saffron and rose water or kewra and then using a piece of foil, cover the entire surface of the saucepan and place the lid firmly over to create a seal, so the steam does not escape the pan. Turn the heat to it’s lowest setting and steam cook for 10 minutes. Once done, remove the foil and let the steam escape. 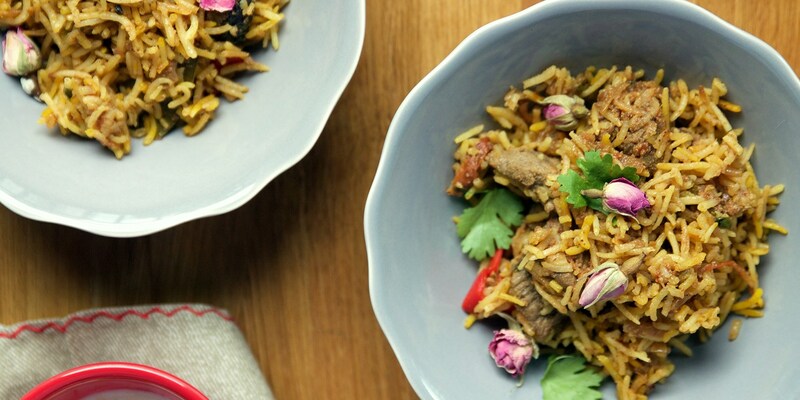 Mix the rice, meat and sauce gently using a dessert spoon so as to not break the rice. Serve hot in a serving dish and scatter over the pistachios and rose petals.